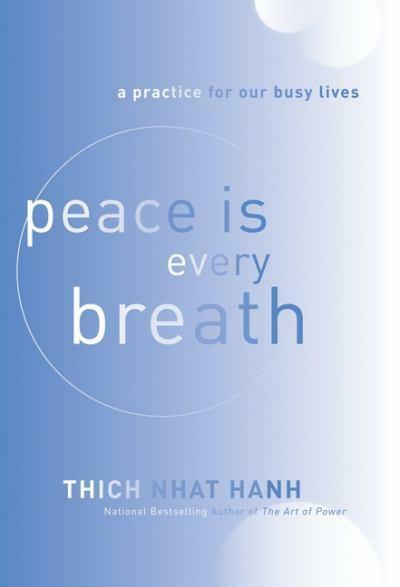 I recently read the book Peace is Every Breath: A Practice for Our Busy Lives by Thich Nhat Hanh. I thought the book would be a newer, revised version of Peace is Every Step, a classic which I also own, but instead the book was quite a bit different. I really enjoyed the book because it was very well written and concisely explained in very clear language how to incorporate mindfulness into everyday life. Thay went over some of the more “simple” practices of mindfulness such as mindful breathing and walking. At the start the practices were presented in such a way to reflect how mindfulness would look in someone’s daily life throughout the day, from waking to eating to working and finally to sleeping. Thay also included some more practices for dealing with deep suffering, and also presented some important Buddhist teachings. I had come across many of these teachings before, but they were explained in the book in a new fresh way, so I got a lot out of them this time. I liked that Thay included a lot of things in a small book using excellent clear language. It was well presented to get to the important points without getting lost in too many details. I was inspired to try my best to practice this in times of stress, instead of letting my mind worry about it and ruminate over a problem to fix it. I particularly enjoyed some of the sections on how to stay in the present moment. Thay talked about how to pull our mind back after letting it wander into the future, but also to avoid letting the past continue to shape us in the present moment when it no longer exists as a reality. I would like to take a few posts to fully explain the story of how I came to Buddhist spiritual practice, starting at the very beginning! This post is part 1. I have met many people in many different meditation groups across the country, and many of these people share that they grew up in strict Christian traditions, either Catholic or strict Protestant traditions such as Presbyterian, before coming to meditation. An experience I share with these people is that I, too, grew up in a Christian family. At an early age, I took part in saying prayers nightly with my other sibling and one of my parents. My extended family that I was very involved in also said grace regularly before meals. I don’t remember going to church until I was about 10 or 12. Unfortunately, the church I attended was the remnants of a once active French-speaking Metis community, so it wasn’t the same community I attended school, and the services were sparsely attended. The priest was French, so he had a thick accent, and I had a difficult time understanding him, as most other children did. The language barrier did little to help my already waning attention. Additionally, very few children attended the church, and there wasn’t a youth group or Sunday school set up. I don’t remember people taking the time to really explain to me many of the Christian teachings. I remember hearing Bible stories, but not really understanding the messages they were supposed to mean. As I grew older, I started to become more insistent that I didn’t want to attend church. I don’t remember ever really wanted to attend for religious or spiritual reasons from the beginning. One of my parents made me go even though I didn’t want to, saying I would be punished otherwise. I went anyway, partly to avoid punishment, but I think partly to make my parents and family happy. Well, let’s just say that that is not exactly the best way to motivate a stubborn child to have faith in their religion! It only got worse later when I was made to attend catechism classes in preparation for confirmation, one of the passing-of-age rituals in the Catholic church. The classes weren’t offered at the church I had been attending, so I had to travel to yet another community, different from the one I attended school, to take courses with a large group of students I mostly didn’t know. I also recall an arrangement with one of my parents that I could only play on the school volleyball if I attended the classes (although my parents don’t remember this!). One Christian experience I do remember positively was attending bible camp as a young teenager. I only attended the camp to take part in all of the fun activities not available to me in my small town (kayaking, wall-climbing). The “bible” part was just an extra detail. I passed as much as I could, pretended to fit in like everyone else, despite my Gideon’s bible that contrasted with many other kids’ special edition children’s bibles. I was swept up along with the crowd when I attended bible camp, inspired by the strong faith of the counsellors and fellow campers around me. I really wished I could be like them, that I could have such strong beliefs. My aspirations never lasted, though, past a week or two once I returned home. I was also a feminist at an early age, so it never sat right with me that women couldn’t be leaders in the Catholic church, or that god was the father and referred to as “he”. I read historical fiction avidly, so I was critical of the historical Catholic church an institution that persecuted women during the Inquisition, and indigenous peoples as part of colonization. By the time I was a teenager, I became more insistent in my independence from my family’s religion. If I didn’t want to go, I was old enough to make that choice and not go. If church helped them, then so be it, but it had nothing to offer me. By now I was getting absolutely nothing out of the masses, I just sat through the empty rituals bored stiff, the meanings of the sermons completely missing their mark for me. My separation from Christianity was complete by the time I was in high school. I had given up on it, I had decided that it had nothing to offer me. I see now, though, that I was never really given the opportunity to learn about the teachings the religion had to offer. I also never had social support available, where I could share my spiritual traditions with other kids my age. By now, I’m able to appreciate my Christian background and what the religion has to offer. Now that I’ve learned much more about the Buddhist religion, I’m able to see endless similarities between the two religions, not to mention between Buddhism and other world religions. I see now that many different religions exist to serve many of the same basic purposes, meeting the same human needs for belief, optimism, community, and explanations for an unexplainable and incomprehensible universe. I’ve also learned some lessons about sexism and other instances of structural violence present in religious institutions (thanks in part to a feminist religious studies university class), so I’m quite quick to jump on the sexism I see and know is present to this day in Buddhist traditions. Now I don’t believe in Jesus the god, but I do believe in Jesus the historical person (man? woman?) (and am surprised to meet Christians who agree with me!). What little I know about Jesus, I can see that Jesus tried to teach people about living in the present moment, as well as about radical notions of the time of interconnectedness, interbeing, and equality. I also appreciate that Jesus appeared to value practice before belief, or making sure that actions spoke louder than words. Finally, I’m tremendously grateful to parents and family for their efforts to give me a religious upbringing and background, and for supporting my early spiritual development! Read on to part 2 in the series: Why Meditation Came Naturally To Me. Yesterday I was fortunate enough to have the opportunity to attend my first ever Wake Up event. This was the first Wake Up event I had heard of that was taking place in Canada, and possibly the last Wake Up event I will be able to go to, so I wanted to check it out while I had the chance. It was the first time I met monks or nuns from Thay’s sangha, and I really enjoyed spending time with them. There were about six or seven monks and nuns who came, and I really enjoyed all of their smiles and laughter, they all seemed very joyful and happy. They also spoke about mindfulness practice, and you could tell that they were firmly enthusiastic about everyone taking up the practice to enjoy the benefits. It was very encouraging. It was also nice to be around such a large group of people my age. There were about 40 people in attendance, as well as four people who helped to organize it. I was very excited and inspired to see so many people my age who were interested in meditation and mindfulness. We spent over an hour in dharma sharing, and almost everyone took a turn speaking about what brought them there that day. I could see a huge variety of reasons and personal situations that affected different people. There was even some discussion about mental illness and difficulties, especially panic disorder and substance use. At the same time, I was mindful of how many people might have wanted to come but couldn’t make it for various reasons, either because they were too busy or had to work, or were afraid of a new situation. These types of thoughts came up the last time I was on my retreat, and I think part of it is due to feelings of inadequacy, like I don’t really deserve to be “taking time off” of my usual life to attend events like these. I could see from the dharma sharing that people do have a lot of reasons for meditation practice even at a young age. I realize now that I hadn’t really spent much time thinking about the certain causes that might make young adults even more likely than people of other ages to turn to the practice. At the same time, I haven’t really thought about the obstacles for practice for young adults. A deep relaxation guided meditation was part of the event, and I really enjoyed it. One of the monks led it and he included many mindfulness songs, and he had such a beautiful singing voice. There was a moment where I enjoyed incredible peace and joy and I felt completely nourished and supported right where I was. A thought suddenly arose: “I am not my work.” I had been trying to leave my worries about my work behind and just enjoy the moment. It was during the deep relaxation that I felt that I was connected with my deepest self, and I felt gratitude that I had made this day more important than my work. It fulfilled a need that goes deeper than work and money.